I have got into a regular habit of playing classical music for the kids to listen to. Hailey is particularly fond of the Nutcracker station on Pandora. Often Even is chosen as her dance partner... he is a good sport about it. Sometimes she tells Evan to take a bow. It was quiet and I went to look for Evan, and there he was on the couch looking at a book. The things they do when they think no one is looking! So far he doesn't appear to be a picky eater, which I love. Everyday I have a little super green drink and Evan always wants a sip. Playing Qwirkle; such a fun game. Evan is going steal all of Hailey's oatmeal. Long live the rocking horse! This has been the best horse... so glad we don't have to feed him or clean up poop! Last night night Steve and I were having a discussion about things we want to do in the next few months up until Christmas. I like to have things planned in advance and on a calendar. Steve suggested I take Hailey to see the Nutcracker. He caught me off guard. I was even more surprised when he told me he had been stashing some brochures and reappeared a few moments later with them. I suggested maybe just buying the live DVD (ballet tickets can be $$$). Steve said nope. He reassured me that Hailey would love this and it was really about the experience of going. The music, the costumes, the dancing, and seeing it in person would be worth the expense. We now have tickets to go the Saturday before Christmas. 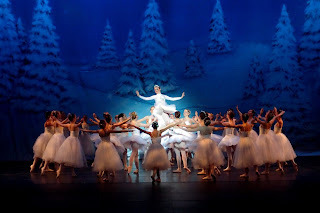 I realize that Hailey is very young, but she truly loves the ballet. We have the animated versions of the Nutcracker and Swan Lake that Hailey loves to watch. She understands the story and plot. We have also checked out books from the library on these ballets. Hailey and I have also watched the professional full feature version of the Nutcracker and she has had no trouble sitting through that. I think she will be delighted to dress up and watch the performance. 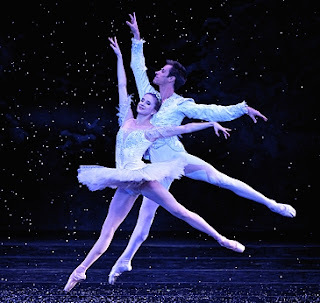 However, if I had a child with a short attention span, or who had no interest in ballet, I would not take them to an event like this in hopes that they might enjoy it. Does he look like trouble? While I was writing this post he threw our basket of clean clothes in the toilet... which Hailey decided not flush after using.